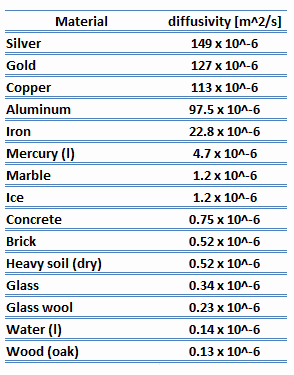 In heat transfer analysis, the ratio of the thermal conductivity to the specific heat capacity at constant pressure is an important property termed the thermal diffusivity. The thermal diffusivity appears in the transient heat conduction analysis and in the heat equation. 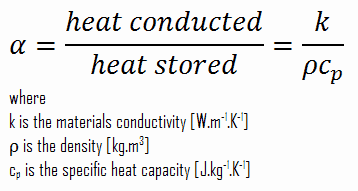 As can be seen it measures the ability of a material to conduct thermal energy (represented by factor k) relative to its ability to store thermal energy (represented by factor ρ.cp). 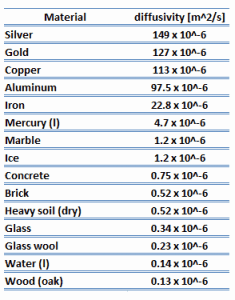 Materials of large α will respond quickly to changes in their thermal environment, whereas materials of small α will respond more slowly (heat is mostly absorbed), taking longer to reach a new equilibrium condition.